I chose the title for this article when I was certain that Frankie Hudders (Frank�s Gym, Wythenshawe), local favourite and co-promoter, had failed in his bid to take the ISKA World Welterweight Muay Thai Championship from Tim Thomas (Team TNT, Bedford). Frankie, a former World Champion, has been fairly inactive in recent years and, despite his power and aggression, he seemed to me to lack the balance and timing of Tim Thomas in the early rounds. He gave the champion plenty of trouble in the later rounds, but was floored by a series of crushing uppercuts in the 4th. Though he came back remarkably well, the decision seemed to me to be clear-cut. Then, to my astonishment (and, it must be said, the astonishment of quite a few other people) Frankie Hudders was given the verdict! A home-town decision? Probably not. The judges didn�t seem the sort of people to be influenced by the crowd mobbing the ring. And one of the strengths of Muay Thai is how open people are about such things: within hours opinions and explanations filled the axkickboxing website. At the end of it all, it was obvious that many knowledgeable folk agreed with me that Thomas had won, but others, including the fight judges, gave equally good reasons for Hudders to come out on top. All agreed that it was close, closer than I had thought. So Disappointment Number 1 fell not to the fans of Frankie Hudders, but to Tim Thomas, certainly an unlucky loser. My second disappointment concerned crowd behaviour. Muay Thai crowds, it is well known, are partisan, but totally sporting � certainly more so than those at conventional western boxing. I loved the way the cheerful enthusiasm of the Evolution crowd from Stafford was rewarded by two winners in the early support bouts: Stephen Edensor, bleeding badly from the nose in Round 2, totally dominated his skilful opponent, Daniel Clear (Golden Cobra), in the 3rd and, after a scrappy opening, James Connor�s low kicks destroyed the apparently calm and poised Azram Quasid (Shinkick Woking) in the 2nd. Sadly, with the final Hudders-Thomas clash, hostile booing of the champion and appeals from the MC to keep away from the ring were common and by Round 5 the young and fit were standing on chairs while the older (like myself) scurried around trying to get a view of the action � and that�s before the ring invasion at the end. 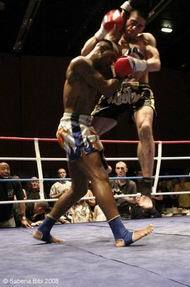 We expect better from Muay Thai audiences as, again, the comments on axkickboxing made clear. The major disappointment for me, however, was the fact that a 10-bout programme was cut down to eight, a short programme by Muay Thai standards, though, with a large number of five-rounders, clocking in at nearly three hours, including a short interval. Unfortunately one of the two fights to be cut featured the superb Jordan Calder � in my opinion, one of the best reasons for buying a ticket for a Muay Thai show. Worse still, the reason for his non-appearance was that his opponent for the Northern Area title had failed to make the weight by some 3 kilograms � careless or what? There were compensations, of course. 16-year-old Darren Till (Sapphire Gym), winning all five rounds against the fit and determined Ricky Williams (Bradford Thaiboxing), displayed grace and skill along with aggression. It was almost a round-by-round masterclass: Round 1 low kicks, Round 2 punches (the bewildered Williams taking a standing count), Round 4 high kicks. Both boys were, I believe, fighting for the first time and both were a credit to the preparation of their trainers. Darren looked to be a special talent: unfortunately his scheduled appearance on Bad Company�s April show in Leeds had to be cancelled. Then there was the amazing fight between Phil Pullen (Shinkick Woking) and Andy Thrasher (GFC Manchester), described by Liam Harrison (who should know) as the best he has seen between UK fighters. 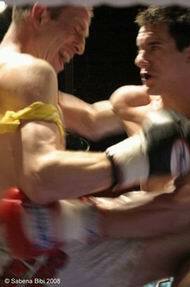 Andy Thrasher�s reputation as a lethal finisher is well known, but the Woking boxer launched into all-out aggression from the first bell. When Andy caught him to the head in Round 2 and forced a standing count, it seemed that Phil�s brave challenge was on the way out. Not a bit of it: for 5 3-minute rounds the action raged and at the end of it Andy Thrasher got a close unanimous verdict � certainly correct, but after such a high-quality (and totally sporting) war I was half-hoping for a draw. We started with disappointments. Let�s finish with the reasons to be cheerful. Wythenshawe Forum, part of a new and impressive complex, is a terrific venue for Muay Thai, spacious and comfortable even with a large crowd, comfortable and with excellent facilities. All officials, from benign referee Dave Jackson to security staff, were excellent. 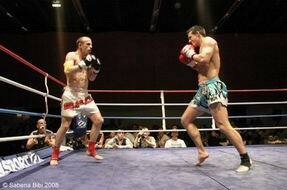 So when�s the next Muay Thai promotion at Wythenshawe Forum?